thought that spring onions & scallions were the same thing) – The Leaves were of darker green shade & much more broad & thick, & the bulbs appeared bigger too than the Scallions which lay just beside them.I came back home buying these, but I had to do a little research to find out if they were the same thing as the young onions. I have used the bulb & the greens. If anyone else has any other information about these confusing young green onions, please let me know. In a bowl, sift flour. Slowly add water in a steady stream while mixing with a wooden spoon or a spatula. Keep adding water until a ball is formed. Knead to make an smooth & soft dough. Let ball of dough rest for about 30 minutes and cover with damp cloth. Divide the dough in 5 or 6 portions. Mix the scallions, ginger Salt & black pepper in a bowl. Set aside. On a floured surface, roll out one portion of the dough into a thin round/rectangle. Brush on oil, cover with scallion mix. 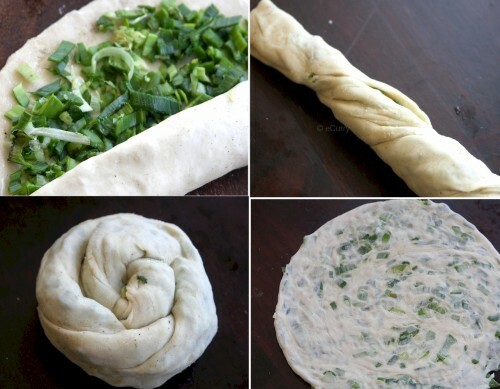 Carefully roll dough like a tube. Squeeze with your finger tips & close both ends. Twist a few times & make a spiral out of this like a snail. Flatten the snails with the palm & carefully roll them out . Repeat the above steps of rolling, filling and shaping for each portion of dough to achieve a 5 to 6 inch pancake for each portion. In a hot non-stick pan, coat with canola oil and pan sear both sides until golden brown. Cut each pancake into wedges and serve immediately with dipping sauce. Combine all ingredients of the Dipping Sauce & mix them well. Serve the warm pancake wedges with the dipping sauce. We had these for Brunch one weekend & really enjoyed it. They will serve well as appetizers too. 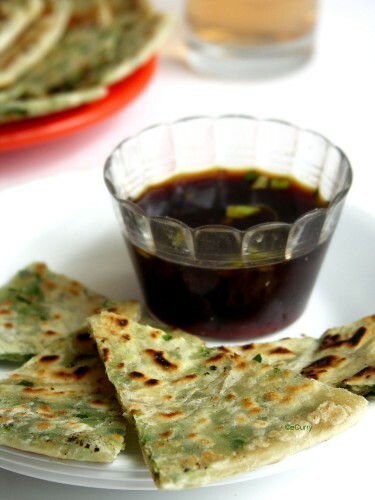 The Spring Onion Pancakes are going to Eating with the Seasons: April hosted by Maninas. Soma, am glad I am not the only one who thought scallions and green onions were the same thing. And lovely step by step for this awesome looking pancake. I want to have a taste and love the dipping sauce. Looks so pretty! The green is really vivid here. looks yum…love the last picture! I’ve seen these pancakes in cookbooks before, but have never made them. I definitely need to try, they look so delicious! Love the way rolled the parathas .. instead of stuffing them. 🙂 Am going to try that dip soon. Wow looks yum… Love the presentation…. What I had been reading is Scallions & Green Onions go together, but Spring Onions are the ones with Thicker Bulbs & Leaves. The one I got was Spring Onions, & U can see from the picture how green the leaves look, unlike the light tender of the Scallions which I commonly use. Nice informative read Soma..thanks …and the pancakes are rich with nutrition..great clicks !! These look delicious! How many pancakes does the recipe yield? Thanks for pointing that out. It makes about 4-5 pancakes. I’ll update the post . Thanks to my Guru of balancing acts! Yet another winning recipe! These would be an ideal quick dinner solution. The pancakes look wonderful, looks like paratha don’t they ? The First source which I have quoted from, has a nice picture of the Spring Onion. I did not take a picture at home, but see the filling & how dark green it is.. unlike the light green of the scallion. In that link u can see the thick dark leaves they have almost like leeks, but the bulbs are not as thick as leeks. jai’s planted lots of onions, so when we get spring onions, i’m gonna try these. i tried your chickpea swirls and loved them. Thanks a lot Bee for letting me know:D.. My DD1 had loved the Stuffed one ( she did not bother much about the regular Khandvi), I need to make it again sometime. Hello, not fair to post the first picture with so many pancakes! 🙂 they look perfect and mouthwatering soma. You way of folding and rolling is very different from mine..i am going to try stuffed parathas this way next time for sure. thanks for the recipe. Love the step by step pictures and the instructions. The second and the last picture in my opinion looks amazing. I have always made the stuffed parathas, but never this way. Love it. Looks like I created more confusion now.. I had added a couple of more links.. read thru’ those if you want to .. One has a picture. Next time I go to the Store, I’ll get both “Spring Onion” & “Scallion” & post a side by side picture. In the mean time, if u happen to go grocery shopping, see if you can find the “onion” with the thicker darker leaves, & thicker bulbs. The “Spring Onion” (bigger ones) are a little more pungent & stronger than the lighter scallions. Atleast that’s my perception. The leaves of these are somewhat like the leaves of Leeks (not as stiff or tight tho’..) & has the flavor somewhere between the scallions & the leeks. 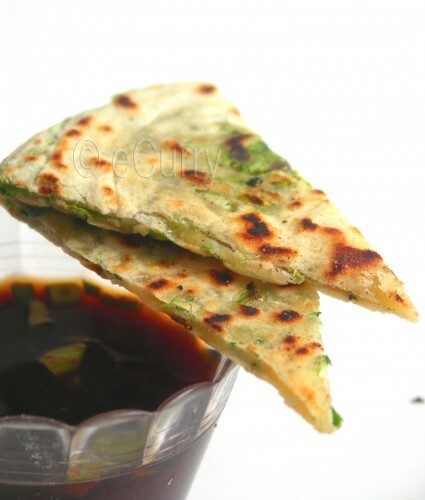 Scallion pancakes /kochi pyanjkolir porotha khob bhalo laghce dekhe ..
ekdin nischoyi kore try korbo ..
Love the idea of using spring onion.. One can call it spring onion parotta?.. Wow! Beautiful picture! Love the way you rolled it out.. 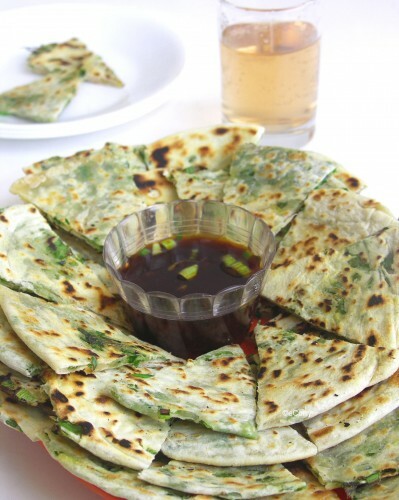 These green onion pancakes look so good! Nice recipe for a simple asian staple. Maybe a little too eager to blow the lid of the “green onions are not scallions” cover-up! Relax, let people call them what they like. Delicious looking pancakes. I do love eating these on it’s own. The flavours are already quite intense as it is. Living here in the US, “green onions” and “scallions” are pretty much interchangable terms, although there may be some regional preferences. I live on the East Coast where they are almost always called scallions but, when I lived in Arizona, they were usually green onions. Spring onions appear here in our farmer’s market only seasonally, in the Spring, believe it or not. My favorite way of cooking them is to brush them with a little olive oil and throw them on the grill until they are just starting to char and soften in the mddle. In the middle of Snowmageddon I found myself dreaming of sweet spring onions. I know what you mean about the grilled scallions.. Does this looks familiar? Very like! In Mexican restaurants the are called cebollitas.